1984. Kosugi Koi farm – Uragara village. First taken here by Hiroshi Kawakami who lives only a short walk away. Owner Eisaku Kosugi must have had significant amounts of wherewithal to build this very impressive facility and home situated right on the road which is more commonly known as ‘Koi Ginza’. Even back then, his garage sported a new Mercedes S600! 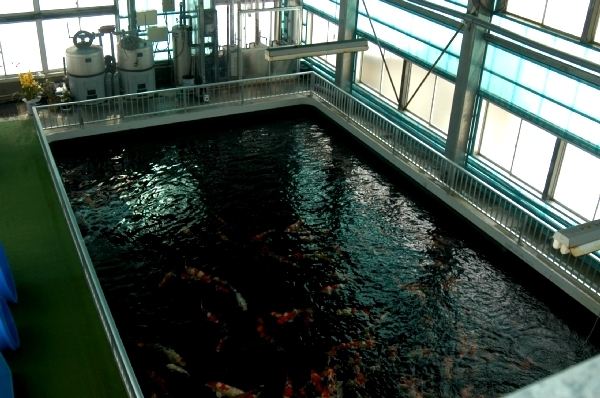 His lavish indoor steel and glass facility is something to behold and displays his collection of jumbo Koi admirably. I have studied closely his selection of Koi on many return visits which comprise of many varieties, both popular and rare, but there always seems to me to be some demerit or other with each Koi when inspected at close quarters. For visitors wishing to take shots of large Nishikigoi in abundance, this may well be an outlet to consider. I have yet to purchase a Koi from this outlet despite all of my many visits. My first impression – ‘take care Waddy’. This entry was posted in mentors. Bookmark the permalink. Recent thoughts together with ancient experiences.